Later today, I'm going undershirt and wife-beater shopping. Warmer months, I shall be ready for ya. The thermals will be drawer'd and I can already feel my back hair blowing in the warm breeze. For now, though -- I'll throw on my black wool overcoat and see a man (me) about a cigar (this one). There is, in the 3/3 just prior to band, a crack in the top-leaf on account of a bulge underneath. I will get what I can from this CAO, and if I must call an early stop to the festivities -- will offer up some song and dance schtick for yer entertainment value. If I don't get a foot BAND, I ain't gonna get a BIG one. Of course, that sized foot-RIBBON -- would also be strange. The graphic design on each says "active deodorant," as much as "cigar." It does state "3 country cocktail" on the foot band, but is that really a huge deal? Primary band slides up over the cap, avoiding boo-boo entirely. Dark chocolate complexion is mottled with some brick red under-tones of uneven depths. Nice sheen over-top. Seams are uneven from near invisible to noticeably loose. Veins are large, in charge, and prominent in a couple places and there's a good amount of horizontal and fairly zaftiq spiders. Cap is well-affixed enough, but a tad short, too. Foot tobacco is packed to a -full eyeballed density and is mainly brunette with a tick or two of auburn. Good luster there. Hand-feel is very nicely balanced with good heft. Sheen transfers greasy to hands. Smooth overall, but there are some impediments via veinages. Charmin squeeze test indicates a -full and somewhat fragile density. There's a trace of tooth here and there. Schnozzing the shaft delivers spiced milk chocolate and fruitinesses. At the foot: some leathery cedar. Funny how the notes seem to blend already. I clip with my gifted Xikar and a cold pull offers milk chocolate, fruit, and cedar -- all on a nice cream. Fairly straight-forward. Fruit seems raisin-esque or at least dried red/purple. A leathery cold finish sets in. Toasting the foot offers up a very crisp leather and spiced cedar aroma. Lights quite readily and starts even-keeled, outdoors and via wooden match. First hot pull is a load of milk chocolate with a cinnamon raisin note close behind, up-top. Some spiced cedar behind that melange. Second hottie is retro-haled to show more cinnamon and also a vanilla note in its wake. That vanilla begins forming the finish. Third hot one is again a milk chocolate led cinnamon raisin primary. Cedar is the middling with a peat addition. Underneath? I'll get back to ya on that 'un. Draw is a very nice low-end medium+ resistance. my fav. Great smoke-hole delivery. Foot-smoke is a medium volume and the room-note is sweet dark tobacco. Ash is 60/40 salt/pepper in tight ladder-rungs. Burn has wavered an un-egregious bit. Packing has softened a few ticks ahead of the burn-line by about half an inch. Line itself is thin+. I give it an on-the-house re-touch, which I won't down-grade for. It responds quite nicely. Raisin ramps up and it's now a raisin cinnamon note to be needlessly precise. Milk chocolate is very nice, but too, simple. Tasty. Tasty is good. A bourbon barrel noses in line and goes to upper middling alongside cedar. I still have yet to find the carrying note here -- definitively, at least. Barnyard handles the post draw toting. Finish is a nice cinnamon vanilla thing with medium legs. Burn is even. Draw is even. Shoulder comes a tick loose. Profile is -medium early and strength is coming, but not here yet. Room-note gets a heightened raisin quality. Packing is re-firming. Chocolate is not coming back to raisin cinnamon; raisin cinnamon is catching up to chocolate. Cedar is spiced the same, but now cushioned with cream as well. Bourbon is very much a player. As the raisin hits chocolate, they marry and I get a Raisinets vibe. Another tandem-note appears as a nutty/coffee note in the lower middling. Chocolate leaps ahead again. My lips get a bit of buttered saltiness schmeared on 'em. Strength is starting to register, we'll call it a -medium. Profile is now medium+. Construction is chugging along. Combustion gives me no gripe opportunity. Ash darkens a tick, but I have a near inch of the solid stuff in very tight and evenly spaced ladder-rungs. I reach for my schmatta as pure schtick -- not outta necessity. Yummy stick. Tandem flavors are nice, but don't lead to the complexities you might expect; nor do they mottle. A bit of red pepper appears on the retro-hale. Vanilla stays on the finish, but is only seen there, once the draw notes subdue. Legs are shorter than the height of flavors would indicate. Flavor notes hold, other than raisin which spikes on occasion. Mouth-feel is a nice moisture level on a thin salted creaminess. Burn-line wavers but so far no touch-up is needed. I roll off an inch+ of ash and it's warm powder. Flavors get a tick huddled so I purge and sit it in my $0.99 Walmart tray, slow-burning tick of top-leaf, downward. Looks like we'll be coasting for a bit, gentlepersons. 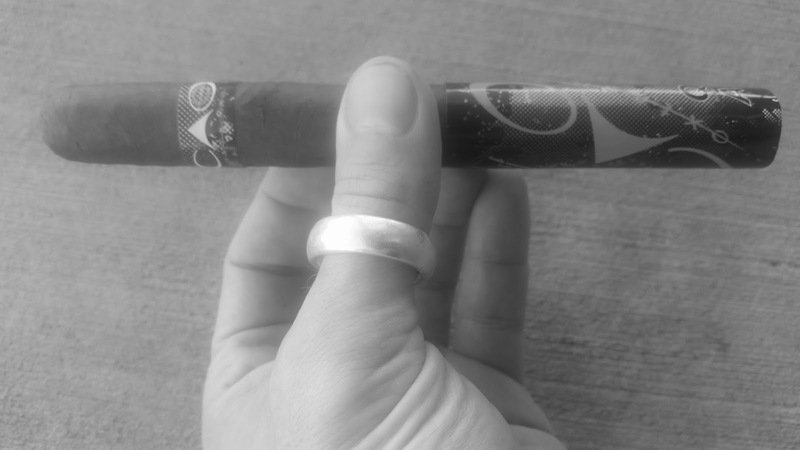 An uncomplicated yummy enough offering, this CAO Extreme. Not the greatest combustion/construction -- but mostly forgivable. I patiently await a nic tuchus-kicking. Burn is wavering ribbons. Espresso comes into the lower middling. Wrapper cracks more. Funny, the original cracked leaf holds quite firm, and its bulge settles. Red pepper tries again. Astringent falls well back and a savory note comes in on its wake. Sharper than I'd like mouth-feel. Chocolate is expanding. There's a baker's chocolate and a nougat quality in it now. Cinnamon falls back but evolves into a red spice rack. Some dark honey sets in. Strength is surging, as is a new nutty thing -- a hazelnut? Finish pulls in its legs. Draw tightens a tick. I'm glimpsing binder at the burn-line. Ladder-rungs grow further apart on the ash. A new goiter forms ahead, at the start of the final act. Smoke out-put dies back and the already slow burn, slows. Oy gevalt, I get to do this longer. Astringent is gone. The new notes beat back the cheap-O bourbon. Chocolate up-top is nice. Its development allows it to hold down the primary fort. Very powdery and warm ash clumps off on my keyboard. Poor Chromebook. Luckily, my schmatta is also a dust cloth. Chocolate falls way back and I purge like purging is going (further) out of style. No help. I'm confused as to what this stick is attempting. Charcoal comes in and spreads. Toasted woods are prominent if not primary notes. I'm coming up on the pre-light mentioned crack now. It re-bulges and cracks more. Flavors thin. Strength stays -full. Why must I suffer so? Thanks, Obama. Ash clumps on my schmatta. Dark honey note re-emerges. Profile is up to a wonky medium+ on a somewhat chemical backing note. Strength is full. Oh, look! The band is almost here. I'm clocking out. Please point me to said clock. Walk me over to said clock. Slowly. No talking, please. Good. Now clock me out. A phone call to AFL-CIO's prez Richard Trumka re: hazard pay. Cuban coffee. Latte. Manishewitz in a big mason jar glass. A handful of Hershey Kisses for when chocolate falters. Did ya catch the news on our Radio Herf 03272016? Great show, highly recommend. Thanks to Fred Rewey for paying a visit. Sabbath Smoker is going video! Maybe not the next one, but def the one after. Check yer local listings. The first video? I'll be smoking a Manolo Estate and telling the story of my schmatta. Wowsers! Speaking of Radio Herf, have you visited my co-host Anthony Welsch's Cigars City recently? Ya should. I'm now editing this review post Nutella and peanut butter sammich, side of Funyons -- over a cup of coffee. Strength is big zetz. Good bit of a sharp chemical note. Note subsides. Not a lotta flavor. Kerosene mouth. I only somewhat regret the Funyons.